Old Granary Pierogi07706 197311work TakeawayOld Granary Pierogi has developed from our passion for cooking and eating good wholesome food and was established in 2014. We’re a Polish family that has chosen to settle in wonderful rural Herefordshire, embracing British cuisine and infusing it with our Polish culinary knowledge and heritage. Our signature dish is pierogi - a traditional, hearty Polish dish which resembles Italian ravioli when boiled or the traditional Cornish pasty when baked. The baked pierogi are hand crafted in yeast dough cases, hand rolled and stuffed with a variety of meaty and vegetarian award winning fillings. The boiled pierogi are also hand made parcels from a simple pasta dough, filled with traditional fillings containing sauerkraut, wild mushrooms, potato, curd cheese and duck. Along both types of pierogi, we also make other dishes from Polish cuisine such as kopytka (Polish gnocchi) with Herefordshire beef goulash or wild mushroom sauce, our signature bigos (hunter’s stew) and more. We cater for our customers’ needs by having gluten-free and vegetarian options available. We use various family recipes for our unique dishes as well as locally sourced ingredients, such as beef and cider. Our foods are available locally and further afield at our Friday takeaway in Marden, many renowned festivals and shows throughout three counties and nationally, private events as well as from our online shop. In April 2018 we are beginning to supply some local independent shops, farm shops and delicatessens with a range of our homemade ready meals, including Pengethley Farm Shop, Burley Gate Community Shop and Locks Garages shop. We’re among three Finalists of the BBC Food and Farming Awards 2018 (Street Food/Takeaway category). We’re also Supporting producers of the Ludlow Slow Food group, Made in HEREfordshire producers and members of the NCASS (National Caterers Association). In 2017 we got shortlisted to the Finals of British Street Food Awards and received a stand visit from the Duchess of Cornwall at the Hay Festival. 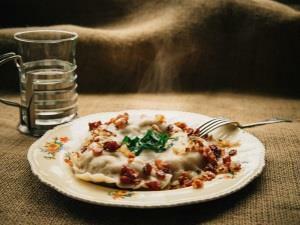 Old Granary Pierogi has developed from our passion for cooking and eating good wholesome food and was established in 2014. We’re a Polish family that has chosen to settle in wonderful rural Herefordshire, embracing British cuisine and infusing it with our Polish culinary knowledge and heritage.